Namibia is the most arid country in Southern Africa, with water a key resource. Rivers that flow all year round – known as perennial rivers – are ‘few and far between’. They are found literally only on the northern and southern borders, more than 1 500 kilometres apart. On the other hand, rivers that flow only after rain – known as ephemeral or episodic rivers – are found throughout the country. How Namibians view these rivers is changing all the time. Some of that change in thinking comes from the growing realisation of the limitations of water resources with Namibia’s burgeoning population, increasingly water-intensive lifestyles, the naturally variable rainfall and even acknowledgement of climate change. It also comes from several international research projects focused on Namibia’s rivers, and the interactions with scientists from throughout the world that accompany those projects. Focusing only on our ephemeral rivers, three in Namibia have received international attention within the context of what is increasingly becoming known as Integrated Water Resources Management, or IWRM for short. IWRM is a new view of water management that is becoming accepted globally. It has four key components: it urges participation in all water planning and management and especially the involvement of women; it considers water to be both an economic and a social good; and it emphasises that water is a finite and vulnerable resource. People working in the water sector and IWRM, specifically, recognise that the ideal unit of area over which to put IWRM into practice, is the river basin – the area from which water drains to a common point. Through IWRM, the basin thus brings together those sharing a common water source – all those upstream and downstream of each other. Many of the first steps towards IWRM and basin management in Southern Africa were taken on a regional basis, with SADC realising that this would be a useful approach in managing our large, perennial river basins, which cross national boundaries. The Zambezi, Okavango and Orange rivers all have established commissions made up of representatives of the countries they flow through so that they can be managed together and more equitably. In Namibia, we are now introducing IWRM at a basin level to our internal, ephemeral rivers – a process that has attracted international attention. The rivers include the Kuiseb River in central-western Namibia, the Fish River in southern Namibia and the Cuvelai Basin ephemeral wetlands in central-northern Namibia. Three more different rivers in Namibia would be hard to find. The Kuiseb has its headwaters in the central highlands near Windhoek. While the basin covers an area of more than 21 000 km2, most of its water originates from rainfall in the 6 600 km2 east of the escarpment. It serves commercial farmers in the upper reaches, the Namib-Naukluft Park and the Topnaar Community in the middle reaches and the town of Walvis Bay along the coast. This river has also provided water for Swakopmund and several uranium mines in the past and, in the case of uranium mines and prospecting activities, continues to do so today. In essence, it is a ‘typical’ catchment with agriculture in the upper reaches and a dense human population near its mouth. For an ephemeral river, the Kuiseb is relatively well known. Observations of its flooding to the coast date back to the mid-1800s. This was only the beginning of a long line of research on this enigmatic river. With the establishment of the Gobabeb Training and Research Centre in 1962, and the observations of the massive flood of that year, research took off with a multiplicity of researchers involved. Many people find the dynamics of the vegetation with its anaboom, camel thorn, false ebony and the well-known !nara plant worth pursuing. More recently, however, the Kuiseb River has become ‘world famous’ amongst water scientists, for it has the longest available data series on water flow from three different gauging stations of any dryland river worldwide. These stations are located at Schlesien upstream from the Kuiseb Bridge in the upper canyon, Greylingshof on the Gaub tributary and at Gobabeb. As a consequence of this availability of information, several international research projects, large and small, have taken place here. A Namibian PhD student working at the University of Cape Town, Klaudia Schachtschneider, is using natural isotopes to determine the source of water used by young and old trees of different species. Are they tapping the deeper groundwater? Are they using the shallow rain- or floodwaters? Do they tap different sources as they grow larger and extend their roots downwards? These are important questions, since these tree species are essential fodder for wildlife and livestock living along Namibia’s ephemeral rivers. On the other end of the scale, scientists from seven countries are using the available Kuiseb data and the support of the renowned Gobabeb Training and Research Centre to investigate water recharge into alluvial aquifers – that is the groundwater upon which Walvis Bay, Langer Heinrich Mine and the Topnaar community depend. Most spectacular is the contribution of the Israeli scientists who erected several Time Domain Reflectometry, or TDR, monitoring probes in the watercourse near Gobabeb. Using a series of point measurements connected to an electronic recorder, extending from the dry surface of the watercourse down to the groundwater table, interns from Gobabeb obtain a record of the downward infiltration of water from a Kuiseb flood and the resulting upward migration of the water table. This information is sent to hydrogeologists Ofer Dahan in Israel and Christoph Kuells in Germany, who analyse the data, capture the results and evaluate the models. These results have revealed one of the slowest infiltration rates yet recorded in arid environments. This is thought to be the result of the intervening silt layers within the sandy riverine soils. In true scientific fashion, this large-scale international project is known as WADE, derived from its full title: Flood Water Recharge in Alluvial Aquifers in Dryland Environments. Yet another exciting aspect of this project is establishing just how high the highest floods in the Kuiseb River were. Namibians remember the 2000 flood when Walvis Bay’s water-supply infrastructure was destroyed for several months. Scientists want to know the frequency and flood height of similar events in the past. The largest floods, identified by Yehouda Enzel of Israel and Gerardo Benito of Spain from slack-water deposits on the walls of the Kuiseb Canyon, were approximately 1 300 m3 per second – close to twice the height of the 2000 flood in the Kuiseb Canyon. Such high floods have occurred approximately ten times over the past 1 300 years. As part of the same project, the interacting dynamics of the ever-changing riverine vegetation and the differing floods from year to year have been analysed by Obbe Tuinenburg of the Desert Research Foundation of Namibia by means of aerial photos. His results bring home the amazing variability of our arid Namib environment. What is a densely vegetated area of riverine sand one year might be totally bare after the next big flood. All of this is natural variability, which will probably increase with future climate change and to which residents must adapt to ensure their livelihoods. As this article is being written, another manifestation of variability in arid Namibia is taking place. In the ephemeral wetlands of the Cuvelai in central northern Namibia, massive efundja floods are arriving from Angola, compounded by heavy local rains. People are being forced from their homes and fields and transport and communication has been greatly impaired. The Cuvelai river system originates in the central highlands of Angola, broadens out into a delta north and south of Namibia’s northern border and then flows down the Ekuma to Etosha Pan. Despite this seeming abundance of surface water, the groundwater that it recharges is very saline and in many instances not fit for human use. As a consequence, potable drinking water is brought to people living in this wetland, by canal and pipeline, from the Kunene River to the west. From an Integrated Water Resources Management perspective, this situation could be improved. An international research project involving Germany and Namibia is addressing exactly this issue by investigating a suite of alternative water sources that could be developed. As is the situation with the Kuiseb River of western Namibia, small and large, local and international research projects have focused on the Cuvelai river system. 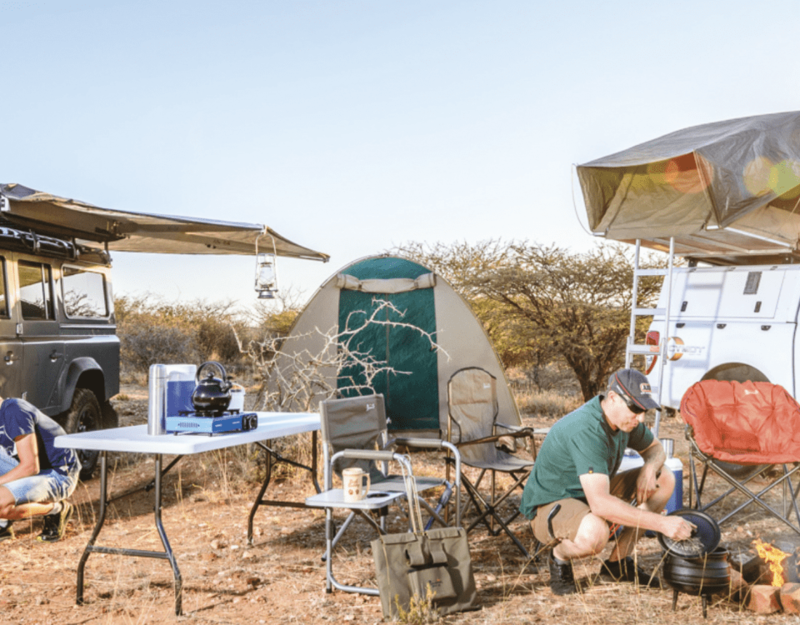 The greatest number of researchers undertook their research in or about the Etosha National Park, the end point of the system. More recently, specific projects have concentrated on the delta itself. During the course of his MSc and PhD degrees, Namibian researcher Charlie Shanyengana studied groundwater chemistry and changes in groundwater quality, particularly the process of salinisation, in the ephemeral watercourses, pans and hand-dug wells. Patrik Klintenberg, also from the Desert Research Foundation of Namibia but originally from Sweden, completed his PhD investigating the interactions among provision of piped water, the response of people and their livestock and the resultant impact on rangelands in the southern part of the system. Other individual researchers have examined the geology, soils and plants associated with this extensive and well-populated ephemeral wetland. Meanwhile, several groups of Namibian and international students have investigated, inter alia, the functioning of water-management committees, the relationship of fruit trees, soils and water flow in the oshanas and the potential of the Etaka Canal to provide water to livestock in the southern Cuvelai system. Many large, international development projects have focused on improving livelihoods in the Cuvelai delta wetlands, all with a smaller or larger applied research component. Most of these development projects have been focused on the provision of sanitation and management of water with an emphasis on community-driven activities. Several research projects, on the other hand, have been designed to provide the basic information needed to enhance water supply and management in the area. The German Federal Institute for Geosciences and Natural Resources, known as BGR, working with the Ministry of Agriculture, Water and Forestry, is investigating the condition of groundwater surrounding the delta searching for freshwater that could be developed for human use. Using a different slant, the Institute for Social-Ecological Research, ISOE, is searching for an integrated approach to water supply and sanitation. Working with rural and urban communities, German and Namibian researchers have been investigating the possibilities of using roof and ground surface collection and storage of rain water, of reusing water for biogas generation and gardening from a sanitation centre, and of small-scale, solar desalination to improve the quality of groundwater for domestic use. How the recent extensive flooding of this inland delta will affect these research projects remains to be seen. Meanwhile, international scientists are closely following the natural developments for which people are currently not well prepared. Flooding in an arid country has also been a highlight of yet another ephemeral river, the Fish in southern Namibia. Sudden, large inflows into the Hardap Dam just north of Mariental, which necessitates opening of the flood gates, have caused the town to be flooded on more than one occasion in recent years. The Fish River, which drains a massive 80 000 km2 area in southern Namibia, winds its way through the second-largest canyon in the world before flowing into the Orange-Senqu River. Despite this flow being erratic – depending on the highly variable rainfall in the region – it provides an important contribution to this otherwise highly regulated perennial river which helps maintain the functioning of the estuary at the mouth, an internationally recognised Ramsar Site. The Fish River Basin is currently part of a regional study looking at the potential of basin management in ephemeral systems with different characteristics and under different conditions. This comparative study, which is funded by the Norwegian Ministry of Foreign Affairs, also includes the Boteti River in Botswana – an ephemeral river flowing out of the Okavango Swamps – and the Buffels River in the Northern Cape. While the three countries operate under different legislative and policy frameworks with respect to water and basin management, they also differ with respect to the characteristics of river flow, water use, land use and socioeconomics. While certain conditions and characteristics promote the integrated management of water resources at a basin level, others might not. This project has facilitated opportunities for many students – from Namibia, South Africa, Botswana, Sweden, the United States and elsewhere – to carry out projects to examine various water resource issues and land-use practices in these river basins. Lessons learnt through this project, combined with those learnt from other basins in Namibia, should help to implement the effective management of ephemeral river basins elsewhere in Southern Africa and the rest of the world. This article appeared in the 2008/9 edition of Conservation and the Environment in Namibia.